Fortnite is really fast and evolving game currently in the world. With such growth comes Bugs and Errors. One such error is this error “You Must Finish Downloading All Content Before Joining a Party” in Fortnite. After we found the solution for the error Login Failure – Network Failure When Attempting to Check Platform Restrictions in Fortnite, we started to get a lot of requests requesting us to find a solution for this problem too. So we did our Researching and Testing, tried a lot of solutions suggested by the experts and then came up with three methods which will fix this problem. Please do read and try all three methods to fix this problem. In this article, we will show you How to Fix You Must Finish Downloading All Content Before Joining a Party in Fortnite. 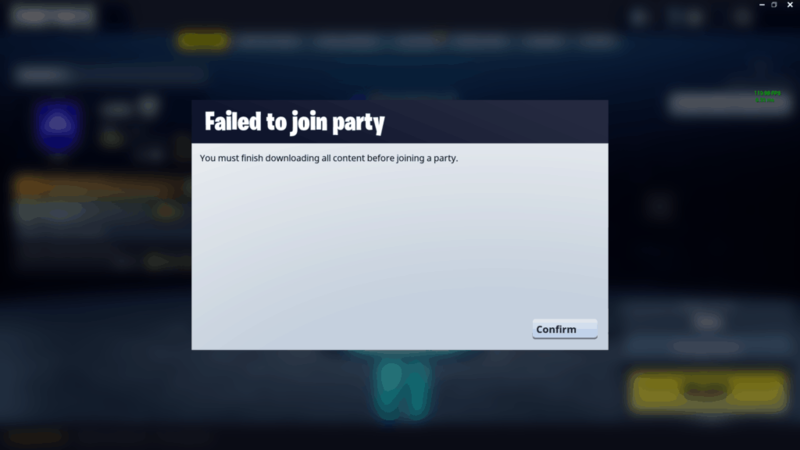 We have come up with three methods that you need to follow in order to fix this error Failed to Join a Party – You Must Finish Downloading All Content Before Joining a Party in Fortnite. This is the easiest method that you can use to Fix this error. In order to start this method, you need to first quit the game. Close the Fortnite Client and also the Epic Games Launcher. Then restart your computer or console. After restarting the computer or console try launching Epic Games and then try launching Fortnite. If this method worked, then please stop here or Try the 2nd Method. This is one of the methods that worked for us 5 out of 5 times, so you need to follow this method properly and carefully. Close the Fortnite Game and the Epic Games Launcher. Restart Epic Games Launcher, You need to verify the files now. Click on the Gear Wheel Icon next o Launch Button. After this close the Epic Games Launcher and try restarting epic games and also Fortnite. This method should have fixed the error. If not follow the next method. This is the final method which is reinstalling the game. Search for “Add or Remove Programs” and Open it. In Add or Remove Programs search for Fortnite in the Search Bar. Click on the game to Uninstall. After the uninstallation is complete then click here to download Epic Games Launcher. After downloading the Epic Games Launcher, you then need to Install Fortnite. I know this is the most time-consuming method because you need to reinstall fortnite which takes a lot of time. But I am 100% sure that this method will definitely work. I hope that the method that we have listed down worked. If it did then please share it with your friends. If it did not work then please comment down and will update you the right solutions. If you have any problem or request then don’t hesitate to comment down below. We will definitely get back to you within 24 Hours. Thank You.